KAMPALA – The Uganda Red Cross Society (URCS) in collaboration with the Ministry of Education and Sports and partners has launched a national initiative – “Keep A Girl in School” to improve menstrual health management among primary and secondary school going adolescent girls and young women. The initiative under the theme; Empowered Girls, Empowered Mothers, Empowered Communities, will be championed by the Uganda Red Cross goodwill ambassadors, friends of the National Society who are passionate about the girlchild and societal well-being. The Goodwill Ambassadors include Mrs Joseline Rugunda, the patron of the team, Mrs Angelina Wapakhabulo, Ms. Crystal Newman and Mrs Susan Katureebe among others. The event at Mackay College at Nateete in Rubaga Division was presided over by the Minister of State for Primary Education, also Woman Member of Parliament for Wakiso District, Mrs Rosemary Sseninde who represented the Minister of Education and Sports Hon. Janet Kataha Museveni. Construction of latrines/toilets and washrooms, provision of water harvesting facilities (water tanks), hand washing facilities and provision of sanitary towels (still in few schools on a pilot basis) to support girls manage their menstrual periods with dignity. Training learners and teachers on Menstrual Health Management and on making re-usable sanitary towels from available local materials. Partnership building and sensitisation of the public, parents, teachers and learners and among policymakers on MHM. A study by International Water and Sanitation Council (2012) estimates that one in ten girls who experience menstruation in Uganda skips school four to five days a month or completely drops out of school. A girl absent from school due to menstruation for four days of every 28-day cycle loses 12 learning days, the equivalent of two weeks of learning and 104 hours of school every school term. Absenteeism has far-reaching implications on girls’ academic performance. The Keep a Girl in School initiative targets to locally fundraise and engage in partnerships to help the girls manage menstruation hygiene. An individual contributing 15,000UGX can keep a girl at school for an entire term according to Mrs Rugunda. “Forego a single meal of chicken and chips and you will help a girl stay in school for a term,” she said at the launch. 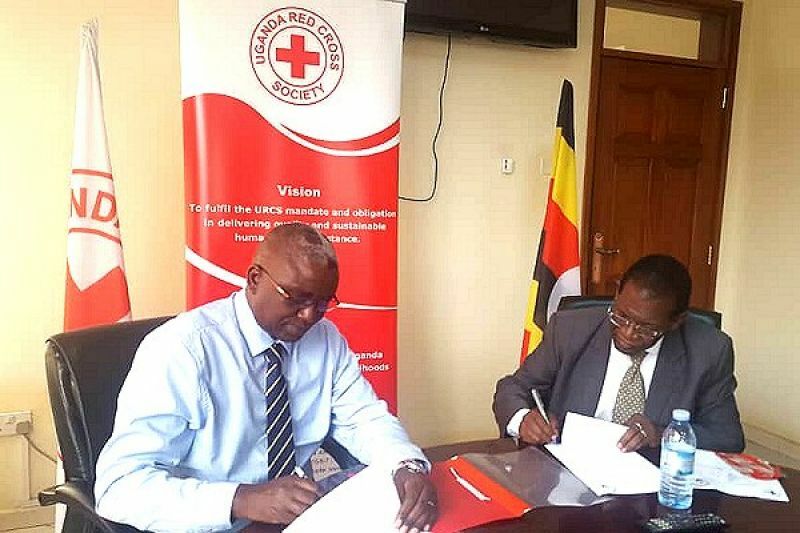 The Secretary-General Uganda Red Cross Society, Mr. Robert Kwesiga said the initiative fits in with the Uganda Red Cross Society perfectly as the body works to save lives and restore human dignity. “Menstrual Health Management plays a crucial role around important issues such as dignity, health, education, protection and security of women and adolescent girls both in emergency and in the development context,” he said. “The Red model is to mobilise communities to join hands so that critical issues affecting the vulnerable populace are addressed. Menstrual Health Management is a fundamental strategy to improving school attendance and retention for the girl child. It is a big agenda of the Red Cross global movement,” he added. The campaign spearheaded by the URCS and the Ministry of Education is supported by a number of partners and will go nationwide with a wider focus on schools in hard to reach areas and those that have economic challenges. The girls of Mackay College and other representative schools left the launch event with packs of sanitary towels as a sign that giving pads had rolled.